Classically designed for a contemporary experience…. Celebrate French Labour Day May 1 with Parisian Gypsy Jazz & French cocktails. Experience VIP on-course viewing of Sail GP races in NY Harbor June 21 & 22. 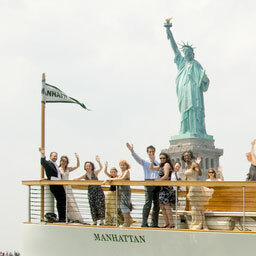 Join us aboard our classic yacht and cruise out with us to see the Statue of Liberty! Whether buying tickets for one of our New York Harbor sightseeing boat tours to cruise out to see the Statue of Liberty, or privately chartering one of our large sailboats or motor yachts for an office outing, you are sure to find yourself on a beautiful boat, surrounded by warm and friendly service, plying through the majestic New York City waterways. We offer a wide range of ticketed sightseeing boat tours in New York City. Whether you are a fan of cruising on an elegant motor yacht to see the entire New York City skyline with comfort and speed, or if you are inclined to take a more adventurous escape on our swift, double-masted sailboats, you are sure to find a cruise that will suit you with service that treats you like royalty. Offering our most premium sailing experience in New York City, the Schooner America 2.0 is the newest, largest, and most elegant sailing vessel designed for our operation. Added to the fleet in 2010, America 2.0 offers the most exceptional day sailing one can find in New York Harbor. She is the fastest, most refined, and the most comfortable sailing vessel in our fleet and perfect to sail NYC! The past meets the future aboard Classic Harbor Line’s Schooner America 2.0. She is modeled after one of the most famous maritime icons of all time, the winner of the first “America’s Cup” of 1851, Schooner America. The “2.0” aspect of the vessel refers to the eco-friendly aspect of her cutting-edge construction by the designers at Scarano Boat Building, of Albany, New York. Rather than finding a diesel-consuming engine room below decks, you find a large battery bank providing electric propulsion. If you peeled away her hull, you find an extremely durable 3-layered composite of a light wood sandwiching an aluminum honeycomb instead a heavy, all wood vessel built from 100’s of trees. In place of a heavy wooden rig aloft, you find carbon-fiber masts, booms, and gaffs. Together, these strengthening and lightening components of construction help America 2.0 sail effortlessly and with less environmental impact. From hoisting the sails, to serving beverages, to taking the time to answer your questions about the sights you are viewing, our crew aims for you to leave our boats feeling like you were always in great hands, and having made some new New York friends. We offer public trips for individuals, couples, families, and small groups, as well as private boat charters where you can customize the route, experience, and dining options for your guests. For power boat fans, the luxurious Yacht Manhattan & Manhattan II are the real gems amongst the New York Harbor boat tours. They are 1920s style, mahogany-trimmed “commuter” yachts that cruise with far fewer passengers than any other Manhattan sightseeing tour boat. Their ticketed harbor cruises average only about 20-100 guests per cruise. They have two regular routes on their ticketed cruises. One of the most unique is a 2.75 hour cruise that encircles the entire island of Manhattan, passing under 18 different bridges, and stopping briefly at the Statue of Liberty. The shorter 1.5 hour cruise is offered regularly during the afternoon, at sunset, and for stellar city lights cruises. This cruise on the Manhattan and Manhattan II captures all the key waterfront sites of the New York Harbor: the Statue of Liberty, Ellis Island, Battery Park, the Financial District Skyline, the Brooklyn Bridge, the East River and the United Nations Building, along with the numerous other landmarks of the Upper New York Harbor. All of these cruises include a complimentary beverage from the teak and mahogany bar within the climate-controlled, sky-lit solarium. You can ride indoors or outdoors in absolute luxury and comfort year round. Aside from the yacht Manhattan’s regular ticketed schedule, you can also take advantage of many unique special event cruises. Each year there is a Mother’s Day Brunch Cruise, a Fourth of July Fireworks Cruise, a series of Fall Foliage boat rides up the Hudson River, a Wine Tasting Series, cruises offering specialty tours of New York Harbor, the only Around Manhattan Architecture Tour, and let us not forget a series of “Full Day Cruises” offering full day excursions to destinations on the Hudson River. Also, look for themed cruises to pop up throughout the year in the special events section of this home page. For the sailing enthusiast, a great way to take advantage of the New York Harbor sights is by sailing, aboard the elegant schooner: The Schooner Adirondack, our 80-foot wooden boat sails daily from Chelsea Piers May through November. She most commonly offers 2-hour day sails and sunset sails throughout the day with guaranteed passes by the Statue of Liberty. The Day Sails are perfect for families and guests interested in seeing the sites. These sails will always feature great views of the Lower Manhattan Skyline and Ellis Island, as well as complimentary beer, wine, Champagne and sodas. Wind and tide permitting, you may find yourself encircling Governor’s Island, or doing a short pass up the East River to get up close to the Brooklyn Bridge. Our Sunset Sail on the Adirondack is great for couples or co-workers looking to unwind after work. Another great NY Harbor sail for the romantic couple or a group of friends looking to have a fun night out on the water is the Schooner Adirondack’s City Lights Sail. This sail is truly magnificent and a local favorite. These sunset sails and city lights sails feature complimentary soda, water, beer, wine, and Champagne. This yacht is perfect for smaller intimate private boat parties. This white-hulled, fan-tailed, plumb bowed mini-yacht is a real charm in the Classic Harbor Line fleet. Certified for up to 40 guests, we are accustomed to hosting no more than 32 on her special, intimate tours and excursions. Kingston features wrap-around seating, a sound system for narration or music, a marine restroom, an open forward deck and a fully equipped bar. She can do a full circumnavigation of the Island of Manhattan in 3.25 hours and can easily visit the many nooks and crannies of the waters surrounding NYC. The back cabin is fully covered but features large slide down windows for a more ‘porch style feel’ when cruising in ideal weather. During cooler months she can be fully enclosed and heated. Private Boat Charters in New York City are an extremely popular choice for corporate entertainment or friends and family gatherings. Classic Harbor Line’s Private Events are perfect for 2 to 100 guests. The Boat Charters on the yacht Manhattan & Manhattan II can be accommodated with a wide range of services including full in-house catering, entertainment, and destination-oriented cruises. Please check out our Private Charters page for more information. *****Tours not taxable, Food and Beverage served aboard are subject to NYS & NYC sales tax which is included in the cruise fares and beverage prices.